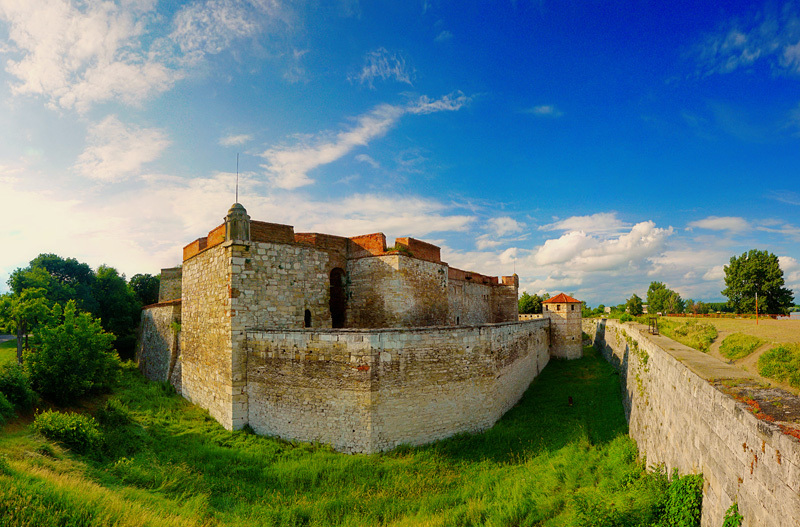 Baba Vida is the only entirely preserved medieval castle in Bulgaria, featuring both a fortification and royal castle. It rises on the banks of the DanubeRiver in the northeast of the city of Vidin. At this point, dominating the surrounding lowlands, the defence systems of the city were concentrated from ancient times. Resisting enemy attacks, the castle has been repaired and expanded several times. Its history dates back more than 2,000 years, going through different construction periods: ancient – I – IV century; Bulgarian – X – XIV century, and Ottoman – XV – XIX century. The restoration activities are from the twentieth century. The basic plan of the castle has not undergone major changes. It occupies an area of ​​9.5 decars, surrounded by a moat with a width of 12 meters and a depth of 6 m. The fortress has a shape similar to a square with the corners oriented to the cardinal directions, with sides of about 70 m length. It consists of two walls – inner high wall with 2.2 meters width and with 9 towers – 4 corner and 5 lateral towers, while the outer wall is lower and connected with two towers. The walls are made of brick and stone (crushed stone) pointed with mortar. The construction is also decorative to a certain extent – there are brick layers, blind arched niches, various geometric shapes preserved till today. The fortress is accessible only from the north, where the entrance tower is located. In the past the moat filled with water from the Danube River was crossed by a wooden drawbridge (now made of stone). The gate leads to the first courtyard. A spiral staircase leads to the patio. In the Middle Ages the patio was larger and a single nave church rose therein, it was a solid stone building and two-section ramshackle building. These buildings were demolished during the construction of warehouses and sentry-boxes at the end of XVII – beginning of XVIII century. Baba Vida Castle was built over the ruins of the ancient fortress Bononia that has probably been built over the ruins of a Thracian settlement ever since the early I century. The northeast corner tower is the best preserved section of the Bononia building, which was later on built in the foundations of Baba Vida. This earliest Roman level of the castle is at elevation 33.20 m.
The start of the first medieval construction period is considered the tenth century AD. The large south-eastern bastion is preserved from this period. Transforming the fortress into a castle began with the first rulers of the Bdin Principality. The final extension was during the rule of Ivan Sratsimir whose name is connected with the main tower of the castle. The exterior walls are also from the medieval construction period – the loopholes from this period are clearly visible on the facades. As of the XV century the castle had defensive functions only. It was reconstructed in the late XVII – early XVIII century, when the advent of firearms set new requirements for this type of facilities. One more line of premises was built around the patio. The medieval towers were filled with stone construction; the peaks were shaped with new loopholes at the highest elevation of 46.67 m.
The planning scheme continued to be elaborated by the formation of ring-yard, the building of barracks premises attached to the western wall of the castle. Having survived the storms of centuries, today the castle is the most impressive monument of the Bulgarian medieval fortress construction. Once there was a rich Bulgarian boyar who had extensive estates stretching from the Carpathians to the Balkan Mountain. After his death, his three daughters Vida, Kula and Gamza split his possessions among themselves. Kula (with a centre in today’s Bulgarian homonymous town) and Gamza (her capital was Gamzigrad, today in Serbia) – married but fell in for bad husbands, who easily wasted their father’s legacy. The eldest sister, Vida, remained single. Under her guidance a castle has been built-up where she lived to a ripe old age and successfully defended her subjects and lands from foreign attacks. As a sign of gratitude after her death, people named the castle after her – the Baba Vida or Baba Vida towers. The fortress is part of the 100 national tourist’s sites.